This affordable and lakefront condo is perfect for a family or 2 couples! This quiet condo complex is located at the end of Lakeview Avenue and situated right on the lake with unobstructed panoramic views. 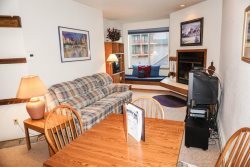 The location of this condo is close to everything that visitors come to South Lake Tahoe for -- five minutes to the casinos, Heavenly Village, Heavenly Mountain Ski resort, hiking and beaches. This cozy home has been an updated kitchen and baths. You walk in on the upper level where both bedrooms are located as well as a full bathroom. What sets this condo apart from the others in the complex is there are two full bathrooms. Your family won't have to share one shower. The master bedroom has a king bed, TV, gas fireplace and private balcony. The other room has a king sized bed, TV and cozy mountain decorations. Downstairs, there is an open concept kitchen and living area. The large sliding doors in the living room open to your own private patio with a brand new BBQ. The living room has a second gas fireplace, which is the heating source for the main level. The two large leather couches in the living room make watching TV or enjoying out the lake views comfortable for the whole family. The kitchen,which has an adjacent dining table for 6, has newly painted cabinets and granite counter tops to give it a very clean, updated feeling. You can even glance over while you cook and see the lake. This condo is the perfect spot to BBQ lakefront during the summer and cuddle up in front of the fire during the winter. The water is at it's highest in years so you will be BBQing right next to the water all summer long. The best part of this condo is you will be able to enjoy those unforgettable Tahoe sunsets from the patio, living room and master bedroom. "We are so excited to have another one of these great lake front condos on our program! They are the perfect place to stay if you're looking for lakefront accommodations close to everything." "I loved how clean and updated this condo was. I felt comfortable during my entire stay. The sunset views were amazing!" This condo features 2 bedrooms, 2 full bathrooms, TVs in all rooms, 2 gas fireplaces, full equipped kitchen, washer and dryer, balcony off master bedroom, patio off living room with a brand new gas BBQ grill. The condo is located near the end of a very quiet complex and right on the lake with unobstructed views. With over 1,300 square feet, you will find a very comfortable space to relax and make memories. The master bedroom has a king bed, the second bedroom also has a king and an air mattress and bedding available for the kids to sleep in the living room. The living room has a gas fireplace, flat-screen TV with cable. Wifi is available. 709 Lakeview #25, South Lake Tahoe, CA. Video produced by Tahoe Real Estate Photography for Pyramid Peak Properties from Tahoe Real Estate Photography on Vimeo. I called in for the wifi password and experienced bad signal couple times. The lady was very patient and helpful. Your place is very clean and has many games. I probably will come back in Winter for snowboarding. We loved it, and have stayed here before. This property is only available 11 months out. Prices are subject to change.